Maybe talking is the wrong word. Creating about Coexist. Thinking about Coexist. Dancing and acting and screaming about Coexist. If you haven’t seen her Art for Freedom project, you probably think I’m making all this up, but I’m not. It’s 17 minutes long, so here’s the gist: Madonna thinks we all need to understand each other better. She’s calling for a revolution, but not one of violence or conflict. Rather, she wants us all to know more, understand more, LOVE more. It’s easy to dismiss this as a stunt; after all, she’s been known for her shock tactics since she’s been Madonna. And that’s part of her point, too: no one is taking her seriously. She has seen the hate that is spreading, experienced the lack of compassion that is dividing the world. She wants to do something about it, even if she doesn’t have a concrete vision for what that something would be. I think the answer is Coexist. And I think the revolution has already started. Hate, violence, prejudice – those three key words we use here to describe what we’re fighting against – are all enemies of love. Her revolution seeks to combat those things, and our strategy for that is through education and economic incentive. We’d like to share with her – and with you – our vision for how to make the world a more understanding place. It starts with education, with creating places for kids who are different from one another to learn together, celebrate their differences and explore their commonalities. When we tie that to economics for the adult generation, it creates a cycle of collaboration. Our current projects in Uganda and India support cooperatives formed by groups who were recently in conflict. We’re incentivizing their inclination and ability to put their differences aside so that they’ll continue to work together. So that their kids will grow up and work together, too. It’s more than an idea — it’s something we’re actually doing. 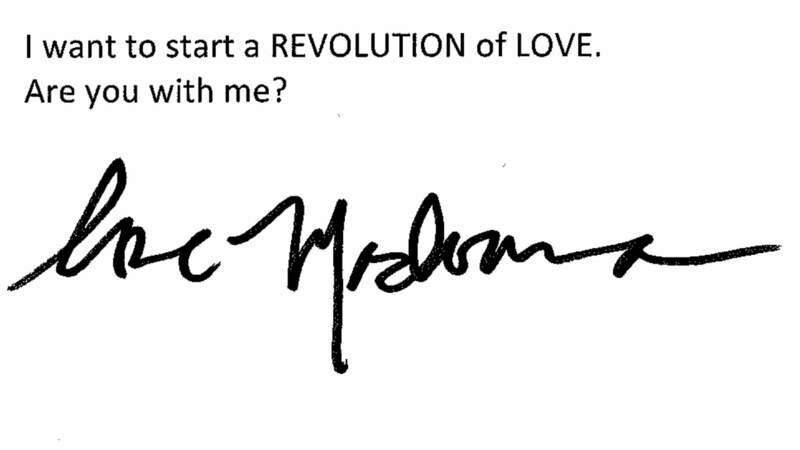 So, welcome to the revolution, Madonna. We can use all the help we can get.